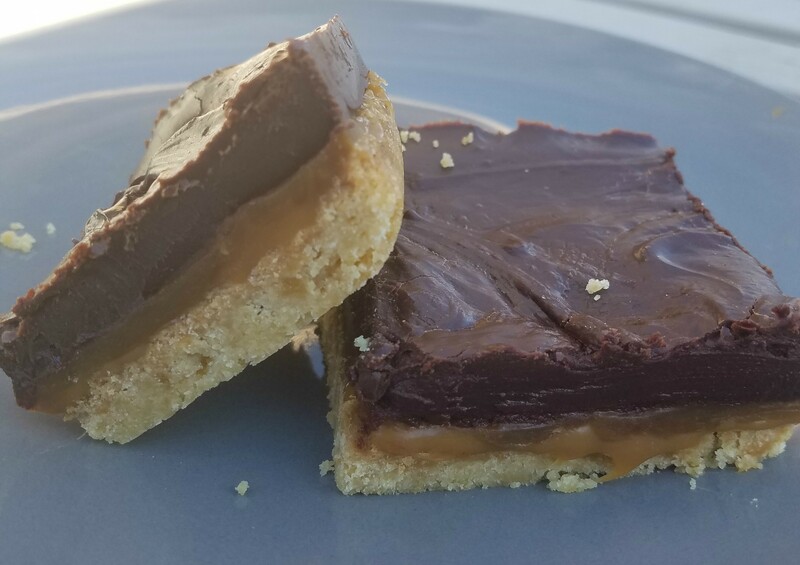 Homemade twix bars made with delicious caramel, chocolate and a crisp shortbread cookie crust. This weekend was a wake up call. The run up the canyon brought new colors to the leaves forming a canopy over me as I ran. The canyon brought tinges of gold and red to the already beautiful green canvas. The cold wind blew right through you and made me realize that winter is knocking. The kids asked for the fall decorations to go up and for pumpkin to be bought. Last week i shared a cake mix pumpkin muffin recipe that worked perfect for me and my dietary needs and helped me embrace the pumpkin season a little easier. Since last week I have bought two three packs of pumpkin and four cans of smaller pumpkin and all have been accounted for. The freezer is going to be full of pumpkin this week. But pumpkin can’t be the focus all of the time so I changed things up and made this dessert. these homemade twix bars are filled with creamy caramel, a chocolate topping and a crisp buttery cookie crust. Delicious!! (Seriously, sometimes it’s SO hard to come up with words to describe how good a recipe tastes). Preheat oven to 300 degrees and line a 9x13 inch pan with parchment paper. In a bowl beat together the butter, sugar and vanilla until smooth. Slowly add in the flour and salt. The mixture will be dry and crumbly but come together after you continue to mix it. Press the dough into the pan evenly. Pierce the dough with a fork evenly throughout the crust. Bake the crust until it's light and brown--approximately 35-45 minutes. Remove crust from oven then set aside to cool completely. Once crust has cooled, melt the caramel and heavy cream in a microwave safe bowl at 30 second intervals, stirring in between cooking times. Once caramel is melted, pour the caramel over the top of the crust and smooth the caramel evenly over the the mixture with a spatula. Set the caramel in the fridge to set for about 30 minutes before adding the chocolate layer. To make the chocolate layer, melt the chocolate chips and coconut oil in a separate bowl in the microwave at 30 second increments, stirring in between cooking times. 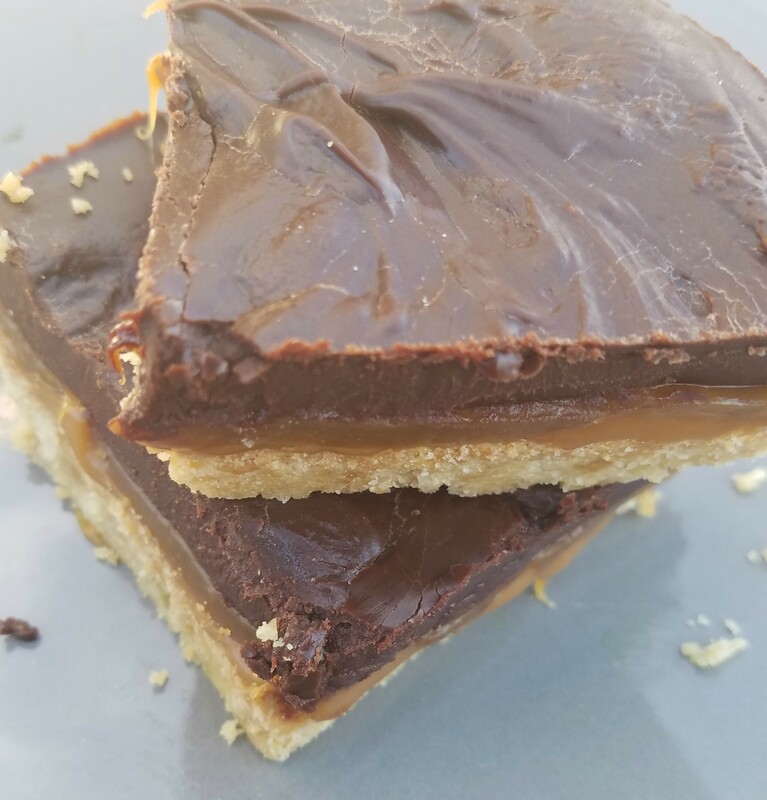 Once chocolate is melted and smooth, pour the chocolate layer over the caramel layer and spread evenly over the caramel layer. Return bars to the refrigerator to allow chocolate to harden. Once chocolate is set, remove from fridge for several minutes and then cut bars into 2x2 inch squares. You can also make these bars look more like traditional Twix bars. After the caramel layer has hardened, remove from refrigerator and cut into strips. Dip the bars into the chocolate.